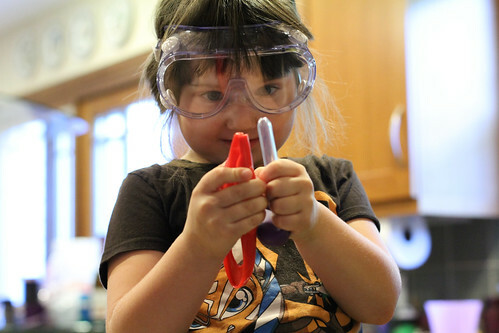 Claire has recently fallen in love with science kits geared to the preschool/Kindergarten level and was utterly delighted to receive a new set for her birthday, unpacking and exploring each item with the purest, most burning glee. We ended up doing an experiment on two dull pennies, with one placed in a test tube of water, the other in lemon juice. We talked about how science is basically about asking a question and then figuring out how to find out the answer, about making a hypothesis and about observing results, and she absolutely ate it all up with perfect joy. 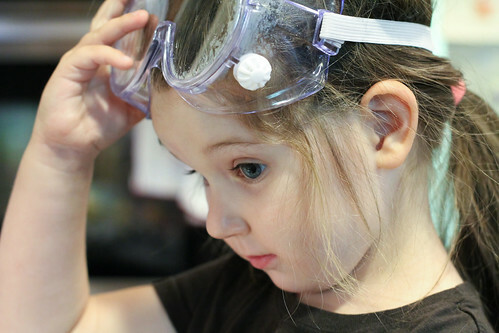 And she frankly looks smashing in safety goggles, like she was born to wear them. Look out, world, I think we've got an evil genius in training.